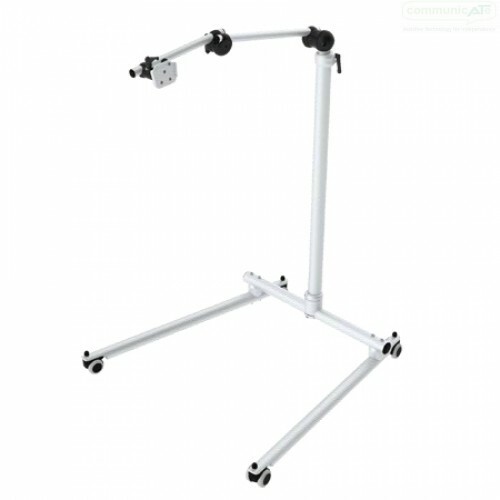 The REHAdapt FloorStand is a upright mount on rolling, locking casters and is great for positioning of electronic communication devices. The REHAdapt FS-TeleLock Floorstand (formerly FS-Standard) is a great tool for "floor mounting" of electronic communication devices, tablets and other technologies. Use over beds, around chairs and up against wheelchairs. It's widely adjustable overhanging arm is composed of Monty3D tubes and includes a gas spring strut for supported height adjustment. This Floorstand has low ground clearance for positioning devices over beds, sofas, recliners or wheelchairs. The Column height is 103 (min) to 173cm max (or 40" – 68"). 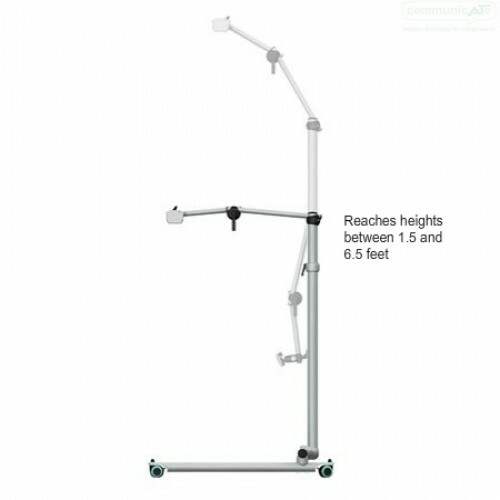 The enitre Floorstand is light-weight yet has excellent stability. REHAdapt’s signature tube joints allow for full 360° adjustment in all dimensions. With quick-shift levers. Quick Release system with two levers allows for safe device attachment within seconds. With a small footprint on the device, yet great sturdiness.